The trick here is thus to essentially reuse modules and their associated electrical subcircuits. For example, if the motor drive as well as the protection and control system of robot #1 from production line #1 in factory A are to be reused in robot #2 of the production line #5 in factory B, you can simply drag and drop the macro of this subcircuit into the plans of the plant at that location. Provided the structure was previously created appropriately, all identifiers stored in the macro will be automatically picked up and inserted into the new structure. 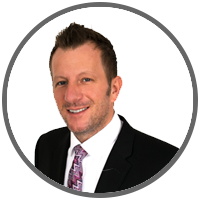 This eliminates the time-consuming and error-prone manual renaming process. 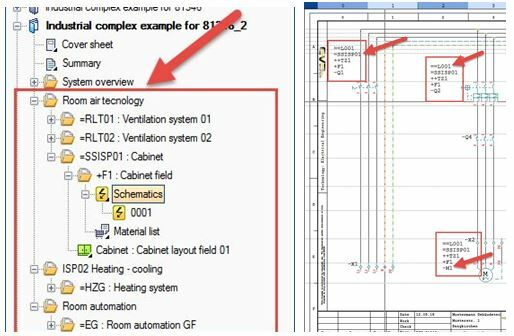 The new reference designations are uniquely assigned to factory B in all documents, including the parts lists, terminal charts, for procurement or costing, etc., – wherever the components appear. A previously created structure, in turn, requires you to “have consistently thought this through from the outset”. A little effort at the beginning saves a lot of time later, avoids confusion and increases the transparency and quality of projects. Designers and operators can now identify and determine the location (++) and mounting location (+) as well as the function (==) and plant (=) at any time. The structure identification is applied to both plants and within plants for specific locations, areas and functions or any categorization and added to a project. 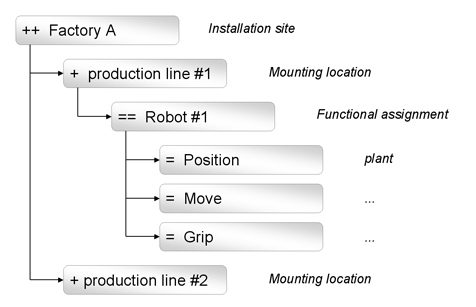 The IEC 81346 standard describes the design of a plant as an object model with the three independent aspects: “product”, “function” and “location”. The scope of this standard extends beyond the purely electrical engineering area and describes technical systems in their entirety. Mechanical elements are taken into account just like typical electrical engineering objects. However, the standard does not dictate how to structure a project; it merely serves as a guide for a clear and comprehensible breakdown of a project. 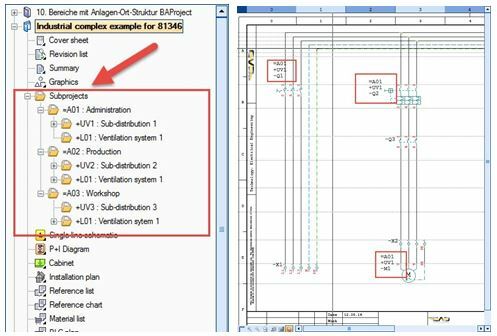 For the parent structure, the new Add-On “Advanced Project Structure” of WSCAD SUITE 2017 is required. A distinction is made here between the areas (administration – production – workshop) and the locations (subdistribution ventilation and possibly heating-cooling). Components installed in the control panel would be found in plant 01, subdistribution 1 and would be followed by the designation of the component, e.g., M1. The full reference name key (ref. name key) in this example would therefore be = A01 UV1-M1. It is, however, also possible to have a more detailed identification of the equipment in the plant as shown in Figure 2. In this example, the plant is not divided into the different areas of administration – production – workshop, but into the technical aspects of the plant: ventilation system – switchgear – technology center – control panel. In this case, the ventilation system (L001) is assigned the function of the switchgear (SSISP01) and, in addition, the Technology Center 1 (TZ1) is divided into multiple locations which, in the example, is the location Field1 (F1). When does it make sense to use the new Advanced Project Structure Add-On? Typical applications are found in plant engineering, the energy industry and the manufacturing of complex machinery. If you lack the expertise or the time to build an efficient and standards-compliant product or plant structure, we would be happy to assist you. Our consultants have extensive experience in the structuring of machines and plants and can draw on a variety of best practices from the industry. In addition, we are also proficient in multiple E-CAD systems. So just check with us even if you are using some other E-CAD system.